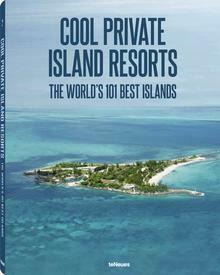 In Part 2 of our series on the top honeymoon and wedding private islands, PIN looks at what just may be the 5 best islands for romance on earth – including the illustrious site of the most famous honeymoon in decades. When it comes to remote splendor, few places can compare to the Whitsunday Islands, a majestic group of sun-splashed tropical isles found right in the midst of Australia’s treasured Great Barrier Reef. Found off the coast of Queensland, about 200km south of the city of Cairns, Orpheus Island has a well-deserved reputation as a top luxury travel destination, frequented by A-list celebrities like Elton John and Phil Collins. Made for romantic celebrations, Orpheus offers a variety of wedding and honeymoon packages; for the big day, the ceremony can be held on a secluded, romantic beach, or even at the end of a jetty with the vast Coral Sea as an unforgettable backdrop. 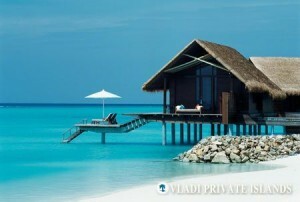 No list of private island honeymoon retreats would be complete without a nod to the Maldives, the ultra-luxurious Indian Ocean haven for elite vacationers, including royalty, film and music stars, and top footballers. In particular, no high-profile model would consider her romance complete without a secretive escape to a Maldivian island resort, like Kate Moss, Naomi Campbell, and Cindy Crawford have all done. Reethi Rah, a gorgeous isle near the capital of Male, offers the best of the Maldives in a picture-perfect setting of tropical gardens, long white beaches and overwater bungalows. Ideal for a decadent wedding or honeymoon experience, the Black Eyed Peas singer Fergie and her husband Josh Duhamel chose Reethi Rah for their honeymoon in 2009. 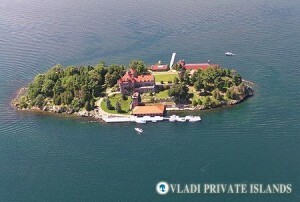 There is no wedding or honeymoon fantasy more enduring than the dream of being king and queen of a fairy-tale castle, and Singer Castle on the St. Lawrence River’s Dark Island offers that experience on your own private island! The ultimate in tasteful luxury, this authentic-feeling replica Scottish castle has just one suite suitable for a maximum of six guests, ensuring a feeling of privacy and seclusion on special occasions. A consultant is available to plan the perfect wedding – the ceremony can be held in the traditionally-cultivated Rose Garden, or on a terrace with sweeping views of the Thousand Islands region in the background. Conveniently found in upstate New York, engaged or newly wedded couples from the East Coast can have a thrilling private island experience surprisingly close to home. 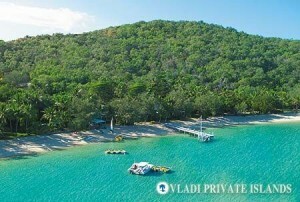 The ultimate host for celebrity weddings and honeymoons is surely the flamboyant billionaire Sir Richard Branson, a famous island lover who owns Necker and Moskito islands in the BVI, and Makepeace Island in Australia. 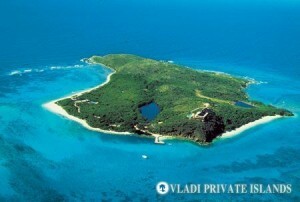 The 74-acre island, currently under renovations after the recent fire (link) has impressed guests like Oprah Winfrey, the late Princess Diana, and virtually every other A-list celebrity out there. The most famous Necker Island wedding has to be that of Google co-founder Larry Page, who threw an unforgettable 600-guest bash on the US $54,500 per day island paradise – although Branson’s own wedding comes a close second, especially as her arrived at the altar clinging to a helicopter. Eager to provide one of the top luxury experiences in the world, the island has numerous staff members that will tailor any celebration to make it perfect. In terms of private island honeymoons, there is one island that stands above the rest; out of all of the incredible resorts in the world, North Island was chosen by the highest-profile newlyweds in decades, with the assistance of Vladi Private Islands, who rented them the island retreat. 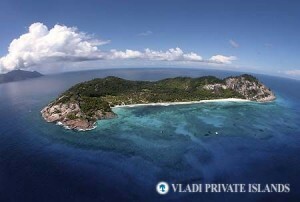 Amid rampant speculation, it was revealed that soon after their marriage, Prince William and Kate Middleton, the Duke and Duchess of Cambridge, escaped to this beautiful isle in the Seychelles for ten days of romantic bliss in villa that rents for almost £4,000 per night. The royal couple were far from alone in admiring North Island’s charms; Salma Hayak and her French businessman husband also enjoyed a honeymoon here, and yet-unmarried Brad Pitt and Angelina Jolie fell in love with the island on a visit in 2010. Should Hollywood’s top power couple ever get around to tying the knot, North Island would be the obvious choice for a honeymoon!